Real Sports is like any sports bar except more over the top. Yes they have a dining area, but it’s over two floors and 2400 square feet situated beside a sports fanatic location – the Air Canada Centre. Their second floor is reserved for private parties but is great for large events with lots of seating, its own bar and even a golf simulator. Sure they have food and drinks, but the menu is extensive and arrives in a bounded leather book. Of course there are television screens, but there are almost 200 of them and one is the largest you’ll find within a North American restaurant. 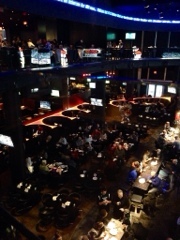 Real Sports is a sports bar first and foremost; but, is also a tourist destination to experience at least once. For those of us based in Toronto, we're lucky that it's conveniently located and actually offers decent food. After having many meals here, I thought I'd share a few of the dishes I like most. 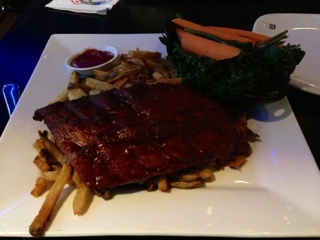 Real Sports serves the same menu for lunch and dinner so you can easily order these whenever. 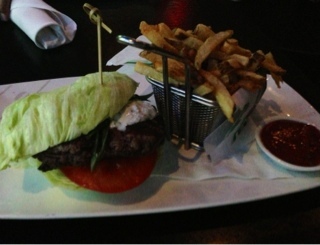 My new go to dish I’ve recently discovered is the lettuce burger ($14.99). The dish is just like their normal charbroiled beef burger, except instead of a bun, the patty is wrapped in layers of crunchy iceberg lettuce. Topped with tomatoes and a delicious tzatziki sauce, it's a delicious alternative and makes you feel less guilty about having the basket of fries accompanying it. The meat itself is a bit dry, likely due to Real Sports using a leaner cut of meat and cooking it to the normal well done Canadian standards (Americans, you’ll find this burger over done). When first reading their menu, bragging about their chicken wings being top rated in Toronto, I had my doubts. 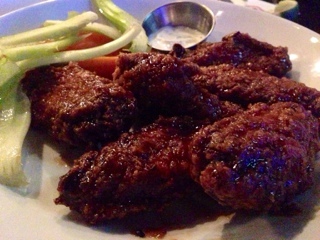 But, after you try their wings, you know they can hold their claim. I tried the sweet Thai chili ($14.99 for 1lb), Chef Tony’s speciality, and admit they are the best I’ve had in Toronto. The wings were a great jumbo size; the worst are scrawny wings consisting of skins and bones and little meat. Although crispy on the outside, the meat is tender and juicy on the inside without tasting overly fatty. Additionally, they are coated with the perfect amount of sauce for my tastes – just enough to cover the wing without making it soggy and pooling at the bottom of the plate. Lastly, if you are feeling hungry then go for their ribs. But, even the only go with the "not so hungry" portion ($18.99) which is already huge. I can't imagine how big their "hungry" ($26.99) size would be! The “not so hungry” portion consists of six ribs and a large portion of fries. The ribs were tender and easily pulled off the bone, yet still tasted like pork thanks to it being slowly braised. However, it lacked the smokiness and barque from a barbecue and smoker that true rib experts would like; nonetheless, they were still tasty. Normally, the dish arrives with coleslaw; not being a creamy coleslaw fan I asked if they could substitute it with vegetables. They agreed and came out with a side dish of boiled carrots and broccolini which were crisp and savoury. I just wished the waitress would have warned me about the $5 supplement, which I would have still paid, but believe pricing transparency is important for a restaurant. Anyone who knows me probably has heard about my love affair with fries. Real Sports fries are concocted from real potatoes but are inconsistent given its likely made in large quantities. When you get them freshly made they are amazing, but when your basket is filled with an old batch they arrive lukewarm and slightly hard. It’s really hard to know when you’ll get a good batch, but my one bad experience occurred during a visit right at the start of the lunch hour (noon); perhaps they start preparing them earlier in the day? Some reviews have complained about the service at Real Sports. Having visited the restaurant numerous times, I have personally never been ignored at the door or have waited a long time for service. Although no one has been outrageously memorable, the service has always been friendly and efficient. Of course, during key game times (like playoff season) Real Sports does get busy and once have been turned away at the door due to the long wait times, but this really isn’t the restaurant’s fault. Real Sports price points are 10-20% higher compared to other pubs, but I find their comfortable environment and food quality worth it. If you’re planning a visit to downtown Toronto you should try it at least once, just to see the television screen if anything.